The gaseous area surrounding the planet is divided into several concentric strata or layers. About 99% of the total atmospheric mass is concentrated in the first 20 miles (32 km) above Earth's surface. Historical outline on the discovery of atmospheric structure. Atmospheric layers are characterized by variations in temperature resulting primarily from the absorption of solar radiation; visible light at the surface, near ultraviolet radiation in the middle atmosphere, and far ultraviolet radiation in the upper atmosphere. The troposphere is the atmospheric layer closest to the planet and contains the largest percentage (around 80%) of the mass of the total atmosphere. Temperature and water vapor content in the troposphere decrease rapidly with altitude. Water vapor plays a major role in regulating air temperature because it absorbs solar energy and thermal radiation from the planet's surface. The troposphere contains 99 % of the water vapor in the atmosphere. Water vapor concentrations vary with latitude. They are greatest above the tropics, where they may be as high as 3 %, and decrease toward the polar regions. All weather phenomena occur within the troposphere, although turbulence may extend into the lower portion of the stratosphere. Troposphere means "region of mixing" and is so named because of vigorous convective air currents within the layer. The upper boundary of the layer, known as the tropopause, ranges in height from 5 miles (8 km) near the poles up to 11 miles (18 km) above the equator. Its height also varies with the seasons; highest in the summer and lowest in the winter. 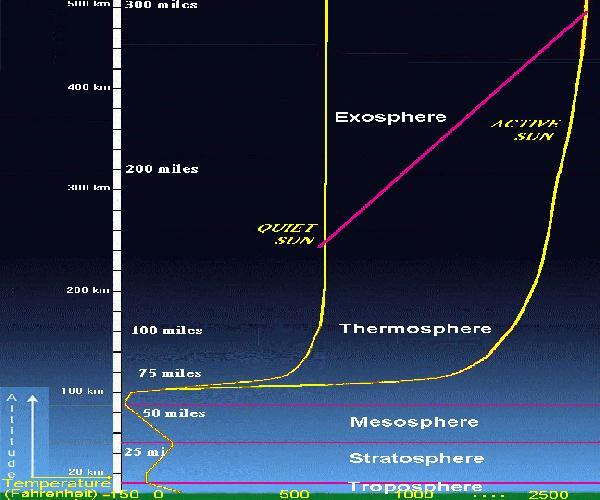 The stratosphere is the second major strata of air in the atmosphere. It extends above the tropopause to an altitude of about 30 miles (50 km) above the planet's surface. The air temperature in the stratosphere remains relatively constant up to an altitude of 15 miles (25 km). Then it increases gradually to up to the stratopause. Because the air temperature in the stratosphere increases with altitude, it does not cause convection and has a stabilizing effect on atmospheric conditions in the region. Ozone plays the major role in regulating the thermal regime of the stratosphere, as water vapor content within the layer is very low. Temperature increases with ozone concentration. Solar energy is converted to kinetic energy when ozone molecules absorb ultraviolet radiation, resulting in heating of the stratosphere. The ozone layer is centered at an altitude between 10-15 miles (15-25 km). Approximately 90 % of the ozone in the atmosphere resides in the stratosphere. Ozone concentration in the this region is about 10 parts per million by volume (ppmv) as compared to approximately 0.04 ppmv in the troposphere. Ozone absorbs the bulk of solar ultraviolet radiation in wavelengths from 290 nm - 320 nm (UV-B radiation). These wavelengths are harmful to life because they can be absorbed by the nucleic acid in cells. Increased penetration of ultraviolet radiation to the planet's surface would damage plant life and have harmful environmental consequences. Appreciably large amounts of solar ultraviolet radiation would result in a host of biological effects, such as a dramatic increase in cancers. A beer can goes to 90,000 feet altitude (17 miles, 27 km) and lands in the "drink"
A balloon is for fine tourists, but try a rocket to get there in a hurry! The mesosphere a layer extending from approximately 30 to 50 miles (50 to 85 km) above the surface, is characterized by decreasing temperatures. The coldest temperatures in Earth's atmosphere occur at the top of this layer, the mesopause, especially in the summer near the pole. The mesosphere has sometimes jocularly been referred to as the "ignorosphere" because it had been probably the least studied of the atmospheric layers. The stratosphere and mesosphere together are sometimes referred to as the middle atmosphere. 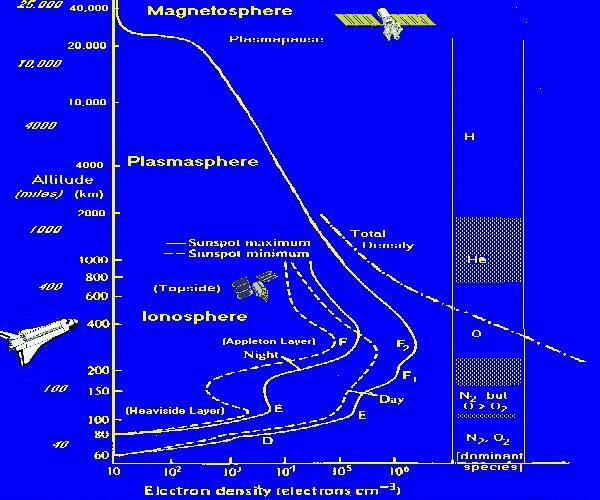 The thermosphere is located above the mesosphere. The temperature in the thermosphere generally increases with altitude reaching 600 to 3000 F (600-2000 K) depending on solar activity. This increase in temperature is due to the absorption of intense solar radiation by the limited amount of remaining molecular oxygen. At this extreme altitude gas molecules are widely separated. Above 60 miles (100 km) from Earth's surface the chemical composition of air becomes strongly dependent on altitude and the atmosphere becomes enriched with lighter gases (atomic oxygen, helium and hydrogen). Also at 60 miles (100 km) altitude, Earth's atmosphere becomes too thin to support aircraft and vehicles need to travel at orbital velocities to stay aloft. This demarcation between aeronautics and astronautics is known as the Karman Line. Above about 100 miles (160 km) altitude the major atmospheric component becomes atomic oxygen. At very high altitudes, the residual gases begin to stratify according to molecular mass, because of gravitational separation. The exosphere is the most distant atmospheric region from Earth's surface. In the exosphere, an upward travelling molecule can escape to space (if it is moving fast enough) or be pulled back to Earth by gravity (if it isn't) with little probability of colliding with another molecule. The altitude of its lower boundary, known as the thermopause or exobase, ranges from about 150 to 300 miles (250-500 km) depending on solar activity. The upper boundary can be defined theoretically by the altitude (about 120,000 miles, half the distance to the Moon) at which the influence of solar radiation pressure on atomic hydrogen velocities exceeds that of the Earth's gravitational pull. The exosphere observable from space as the geocorona is seen to extend to at least 60,000 miles from the surface of the Earth. The exosphere is a transitional zone between Earth's atmosphere and interplanetary space. The upper atmosphere is also divided into regions based on the behavior and number of free electrons and other charged particles. The ionosphere is defined by atmospheric effects on radiowave propagation as a result of the presence and variation in concentration of free electrons in the atmosphere. D-region is about 35 to 55 miles (60 - 90 km) in altitude but disappears at night. E-region is about 55 to 90 miles (90 - 140 km) in altitude. F-region is above 90 miles (140 km) in atitude. During the day it has two regions known as the F1-region from about 90 to 115 miles (140 to 180 km) altitude and the F2-region in which the concentration of electrons peaks in the altitude range of 150 to 300 miles (around 250 to 500 km). Most recent map of the Height of Maximum (hmF2). 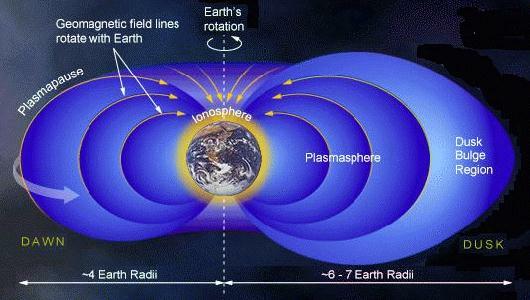 The ionosphere above the peak electron concentration is usually referred to as the Topside Ionosphere. The plasmasphere is not really spherical but a doughnut-shaped region (a torus) with the hole aligned with Earth's magnetic axis. [In this case the use of the suffix -sphere is more in the figurative sense of a "sphere of influence".] The Earth's plasmasphere is made of just that, a plasma, the fourth state of matter. (Test your skills on sorting the states of matter with the Matter Sorter.) This plasma is composed mostly of hydrogen ions (protons) and electrons. It has a very sharp edge called the plasmapause. The outer edge of this doughnut over the equator is usually some 4 to 6 Earth radii from the center of the Earth or 12,000-20,000 miles (19,000-32,000 km) above the surface. The plasmasphere is essentially an extension of the ionosphere. Inside of the plasmapause, geomagnetic field lines rotate with the Earth. The inner edge of the plasmasphere is taken as the altitude at which protons replace oxygen as the dominant species in the ionospheric plasma which usually occurs at about 600 miles (1000 km) altitude. The plasmasphere can also be considered to be a structure within the magnetosphere. Outside the plasmapause, magnetic field lines are unable to corotate because they are influenced strongly by electric fields of solar wind origin. The magnetosphere is a cavity (also not spherical) in which the Earth's magnetic field is constrained by the solar wind and interplanetary magnetic field (IMF). The outer boundary of the magnetosphere is called the magnetopause. The magnetosphere is shaped like an elongated teardrop (like a Christmas Tree ornament) with the tail pointing away from the Sun. The magnetopause is typically located at about 10 Earth radii or some 35,000 miles (about 56,000 km) above the Earth's surface on the day side and stretches into a long tail, the magnetotail, a few million miles long (about 1000 Earth radii), well past the orbit of the Moon (at around 60 Earth radii), on the night side of the Earth. However, the Moon itself is usually not within the magnetosphere except for a couple of days around the Full Moon. Beyond the magnetopause are the magnetosheath and bow shock which are regions in the solar wind disturbed by the presence of Earth and its magnetic field.